Dock Accessories | Dock Wheel Mounting Kit | VE-VE Inc. 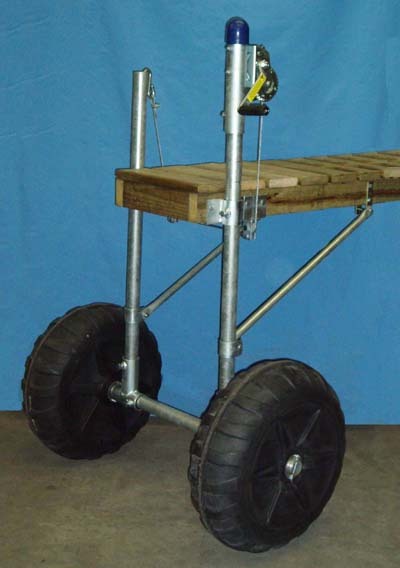 The WD-55; "Dock Wheel Mounting Kit" provides brackets, brace bars with clamps for pipe uprights and all hardware to attach a pair of IWP-62; "Installation Wheels" with 1-1/2" pipe hub ( IWP-62 SOLD SEPARATELY ) to a wood or steel framed dock using 1-1/2" galvanized pipe ( 1-7/8" O.D.) as an axle and down support pipes. ( PIPE NOT INCLUDED IN KIT ). ( Included are ) 2 ea. 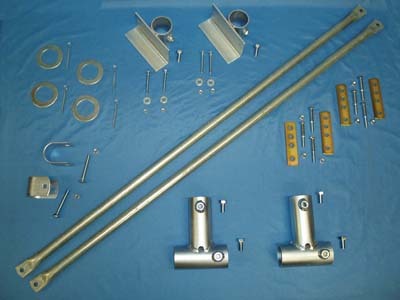 Brace bars made of 3/16" x 1-1/4" x 1-1/4" x 46-1/2" long Steel angle. 2 ea. Straight Brackets made of 3/16" x 2" x 3" angle 6" long with a 2" x .154 w. x 3" L. pipe welded to it ( w/ 1/2" nut for 1/2"-13 x 1" bolt, included ). 2 ea. T- Brackets made of 2" x .154 w. Pipe ( w/ 1/2" nuts for 1/2"-13 x 1" bolts, included ). These brackets and all other brackets and fasteners are zinc plated ( Straight brackets may be painted gray ). NOTE: Photo below is shown with WD-75; Dock Leveling Kit ( Also Not included in kit ) available as an option.